Google Chrome is a nice web browser that gives best web browsing experience. Not only web browsing, there are many other tasks which we can perform with Google Chrome. By using some extensions, we can enhance the performance of Chrome and use it more than just a browser. We have already covered many nice Chrome extensions to trick Google Chrome for many other tasks. In this post, I am going to post few lesser known Google Chrome features that might help you.Read: Why Google Chrome is Best Browser? Do you know that you can perform mathematical operations direct from Chrome’s address bar? Just type mathematical expression in the address bar and it will get the result from Google. You do not need to go to Google for the answer. This calculator is not limited to simple mathematics calculations. I tried some trigonometric expressions and got instant answers. Do not forget to check this feature of Chrome. Google Chrome has a secret Mode called Incognito mode. This is one of the lesser known features of chrome and unknown to many chrome users. Google Chrome offers an incognito mode for private web browsing. When you are browsing the web in incognito mode, your internet activity will not be recorded. Web pages you browsed and files you downloaded will not be recorded. Cookies generated while browsing incognito mode will also be removed. But your bookmarks and general settings will be available. To open Chrome in incognito mode, click on the Chrome Menu in browser’s tool bar and then select “New Incognito Window.” Alternatively, you can use keyboard shortcut CTRL+Shift+N to open incognito mode. Yes, you read it right. You can access bookmarks and apps of your browser from any computer in the world. For this, you only need to sign in into your chrome browser with your Google Account. And Chrome will automatically sync your browser’s bookmarks and apps. Any change you made within Chrome on one device will also be synced to all devices. You can also choose what you want to sync. You can access advanced settings by clicking on Chrome menu and then “Signed in as….” option. And then click on Advanced sync settings button. 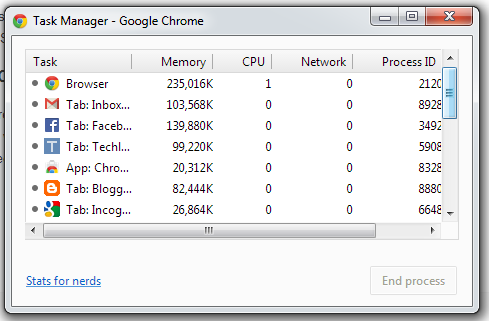 Google Chrome also has a task bar that lets you check the memory usage and CPU usage by a Chrome tab. You can also close any tab from task manager if you think it is using too much resource. To open the task manager, use keyboard shortcut Shift+Escape and see the task manager. Alternatively, click on Chrome menu, then tools and select task manager. It also lists all extensions and memory usage. This is another less known but important feature of Google Chrome. 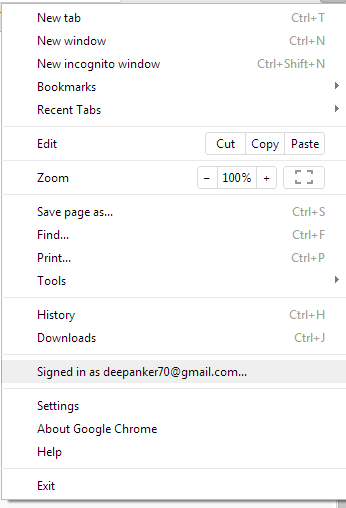 You can set Chrome to open all your last pages when you open browser. If by mistake you closed your browser, you will get back all your tabs when you open Chrome back. There was another option to get all your previously closed tabs in Chrome. But it is removed in the latest version of the browser. So, this feature has more importance now. For this feature, Click on Chrome menu and then settings. Here see “On startup” section. Select Continue where I left off option. And enjoy all last tabs. You can also browse other Google Chrome Tricks on our website. We have several interesting articles to read.